One of the things that I specialize in, in my shop, is cast metal. I cast pewter, bronze, white bronze, and sterling silver into an assortment of pieces of jewelry and dress accessories. Customers often ask me questions about casting, so I am going to write a set of blogs to help folks understand the basics of casting. A common, and relatively simple form of casting, that was done before and during the Middle Ages, was soapstone casting. This is a relatively straight forward process where the artist carves soapstone to create cavities that molten metal can be poured into. 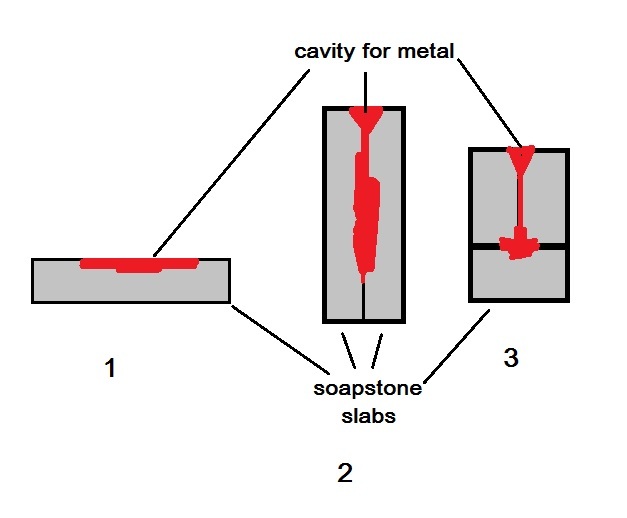 This graphic shows three basic mold forms with one, two and three slabs. I am going to assume that you have purchased good quality soapstone that is designed for carving. It should not have veins or cracks in it, and the texture should be uniform. Let’s run through the basic process of making soapstone molds. It is possible to cast a simple object by carving into a single piece of stone, but most molds are made from two or more pieces of stone. One of the critical first steps when you are using two or more slabs of stone is to make sure that the slabs fit together tightly. The easiest way to do this is to choose two pieces of slab that are identical in size, flatten them as much as possible by rubbing them on a piece of fine wet/dry sand paper and then rubbing them together against each other. Using wet/dry sandpaper means that you can use it wet if you want to. Start with a coarse grade of sandpaper and work with finer and finer grades until the faces of the slabs are smooth. At this point I should mention that you should be wearing a good dust mask when you do this. Soapstone that is sourced from reputable companies is guaranteed not to contain asbestos, but stone dust is still not good for you. So, back to the two piece mold. The two slabs of stone are now smooth and they fit together like a glove. It is now time to mark the outsides of the mold to make it easy to see when the mold is aligned correctly. I usually just line the two slabs up carefully and then draw lines across the side with an indelible magic marker. Mark each side with a different number of lines to make it super obvious which way the blocks need to be aligned. Once the blocks are marked it is time to lay out the design on the blocks. The design should be sized and placed so that there is at least 1/2 inch of uncut stone around the outside of the design. Having a band of stone that is narrower around the outside edge means that the mold is much more likely to break. The same properties that make the soapstone a delight to carve, also make it fragile. Your mold will eventually break, but a carefully thought out layout will greatly improve its longevity. This entry was posted in Jewelry, Metal Casting, Metal Working by Eirny. Bookmark the permalink.